At the time of their accession, Finland and Sweden were granted additional salmonella guarantees covering trade in fresh meat from bovine and porcine animals, fresh poultrymeat and table eggs which were extended to minced meat by Council Directive 94/65/EC (2). Those guarantees were set out in certain Directives, as amended by the Act of Accession for Austria, Finland and Sweden, namely as regards food in Council Directive 64/433/EEC (3), in respect of fresh meat, Council Directive 71/118/EEC (4) in respect of fresh poultrymeat and Directive 92/118/EEC (5) in respect of eggs. As from 1 January 2006, Directives 64/433/EEC, 71/118/EEC, and 94/65/EC are to be repealed by Directive 2004/41/EC of the European Parliament and of the Council of 21 April 2004 repealing certain Directives concerning food hygiene and health conditions for the production and placing on the market of certain products of animal origin intended for human consumption and amending Council Directives 89/662/EEC and 92/118/EEC and Council Decision 95/408/EC (6). Directive 92/118/EEC is to be amended by Directive 2004/41/EC. Article 4 of Directive 2004/41/EC provides that pending the adoption of the necessary provisions on the basis of Regulations (EC) No 852/2004 (7), (EC) No 853/2004, (EC) No 854/2004 (8) of the European Parliament and of the Council or Council Directive 2002/99/EC (9), the implementing rules adopted on the basis of Directives 71/118/EEC and 94/65/EC and those adopted on the basis of Annex II to Directive 92/118/EEC, with the exception of Council Decision 94/371/EC (10) are to continue to apply mutatis mutandis. As from 1 January 2006, new rules concerning special guarantees for food in respect of salmonella will apply under Regulation (EC) No 853/2004. There is therefore a need to update and complement as appropriate the implementing provisions provided for in Commission Decision 95/168/EC of 8 May 1995 establishing, as regards salmonella, additional guarantees for consignments to Finland and Sweden of certain types of eggs intended for human consumption (11), Council Decision 95/409/EC of 22 June 1995 laying down the rules for the microbiological testing by sampling of fresh beef and veal and pigmeat intended for Finland and Sweden (12), Council Decision 95/411/EC of 22 June 1995 laying down the rules for the microbiological testing for salmonella by sampling of fresh poultry meat intended for Finland and Sweden (13), and Commission Decision 2003/470/EC of 24 June 2003 on the authorisation of certain alternative methods to be used in microbiological testing of meat intended for Finland and Sweden (14), pursuant to the new provisions of Regulation (EC) No 853/2004. It is furthermore appropriate to gather all the provisions in one Commission Regulation and to repeal Decisions 95/168/EC, 95/409/EC, 95/411/EC and 2003/470/EC. Implementing provisions should also be adopted for the new special guarantees laid down in Regulation (EC) No 853/2004 as regard minced meat from poultry. The rules relating to microbiological tests by sampling should be drawn up laying down the sampling method, the number of samples to be taken and the microbiological method to be used for examining the samples. In the rules on sampling methods, it is appropriate to make a distinction, as regards meat from bovine and porcine animals, between carcases and half carcases, on the one hand and quarters, cuts and smaller pieces on the other, and, as regards meat from poultry, between whole carcases, on the one hand, and parts of carcases and offal on the other. It is appropriate to take account of international methods for the sampling and for the microbiological examination of samples, as reference methods, while allowing the use of certain alternative methods that have been validated and certified as providing equivalent guarantees. It is necessary to update or to establish where appropriate the models of trade and certification documents accompanying consignments and declaring or certifying that the guarantees are fulfilled. 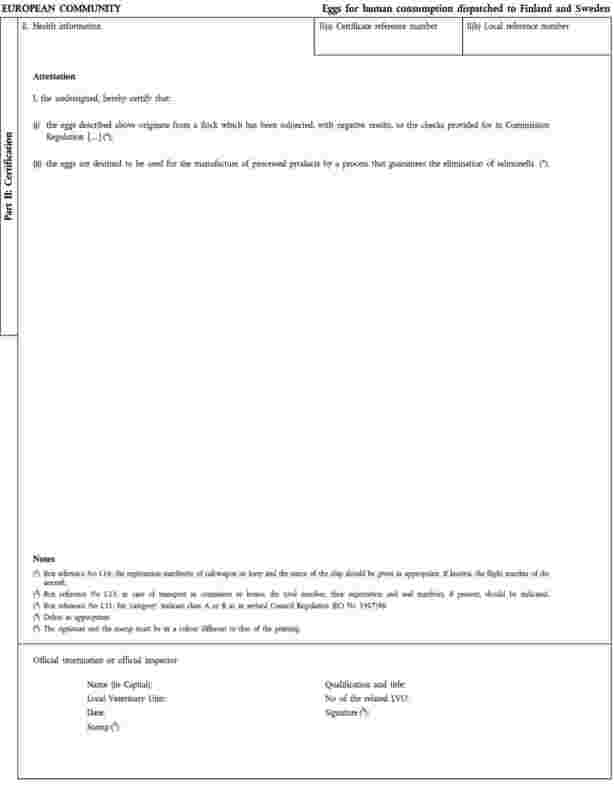 Pursuant to Article 8(2)(c) and (d) of Regulation (EC) No 853/2004, the special guarantees should not be applicable to any consignment that is subject to a programme recognised as equivalent to that implemented by Finland and Sweden, or to consignments of meat from bovine and porcine animals and eggs destined to special treatments. The sampling of meat from bovine animals, including minced meat but excluding meat preparations and mechanically separated meat, intended for Finland and Sweden, and subjected to a microbiological test shall be carried out in accordance with Annex I. The sampling of meat from porcine animals, including minced meat but excluding meat preparations and mechanically separated meat, intended for Finland and Sweden and subjected to a microbiological test, shall be carried out in accordance with Annex I. The sampling of meat from domestic fowl, turkeys, guinea fowl, ducks and geese, including minced meat but excluding meat preparations and mechanically separated meat, intended for Finland and Sweden and subjected to a microbiological test, shall be carried out in accordance with Annex II. The sampling of the flocks of origin of the eggs intended for Finland and Sweden and subjected to a microbiological test shall be carried out in accordance with Annex III. method No 71 described by the Nordic Committee on Food Analysis (NMKL) (16) (method No 71). Where the results of the microbiological testing are contested between Member States, the most recent edition of EN/ISO 6579 shall be regarded as the reference method. methods that have been validated against the most recent editions of EN/ISO 6579 or of method No 71 and if a proprietary method, certified by a third party in accordance with the protocol set out in standard EN/ISO 16140 (EN/ISO 16140) or other internationally accepted protocols. 1. Consignments of meat referred to in Articles 1, 2 and 3 shall be accompanied by a trade document complying with the model set out in Annex IV. 2. Consignments of egg referred to in Article 4 shall be accompanied by a certificate complying with the model set out in Annex V.
Decisions 95/168/EC, 95/409/EC, 95/411/EC and 2003/470/EC are repealed. Done at Brussels, 14 October 2005. (1) OJ L 139, 30.4.2004, p. 3, as corrected by OJ L 226, 25.6.2004, p. 22. (2) OJ L 368, 31.12.1994, p. 10. Directive as amended by Regulation (EC) No 806/2003 (OJ L 122, 16.5.2003, p. 1). (3) OJ 121, 29.7.1964, p. 2012/64. Directive as last amended by the 2005 Act of Accession. (4) OJ L 55, 8.3.1971, p. 23. Directive as last amended by the 2005 Act of Accession. (6) OJ L 157, 30.4.2004, p. 33 ,as corrected by OJ L 195, 2.6.2004, p. 12. (7) OJ L 139, 30.4.2004, p. 1, as corrected by OJ L 226, 25.6.2004, p. 3. (8) OJ L 139, 30.4.2004, p. 206, as corrected by OJ L 226, 25.6.2004, p. 83. (9) OJ L 18, 23.1.2003, p. 11. (10) OJ L 168, 2.7.1994, p. 34. (11) OJ L 109, 16.5.1995, p. 44. Decision as amended by Decision 97/278/EC (OJ L 110, 26.4.1997, p. 77). (12) OJ L 243, 11.10.1995, p. 21. Decision as amended by Decision 98/227/EC (OJ L 87, 21.3.1998, p. 14). (13) OJ L 243, 11.10.1995, p. 29. Decision as amended by Decision 98/227/EC. (14) OJ L 157, 26.6.2003, p. 66. 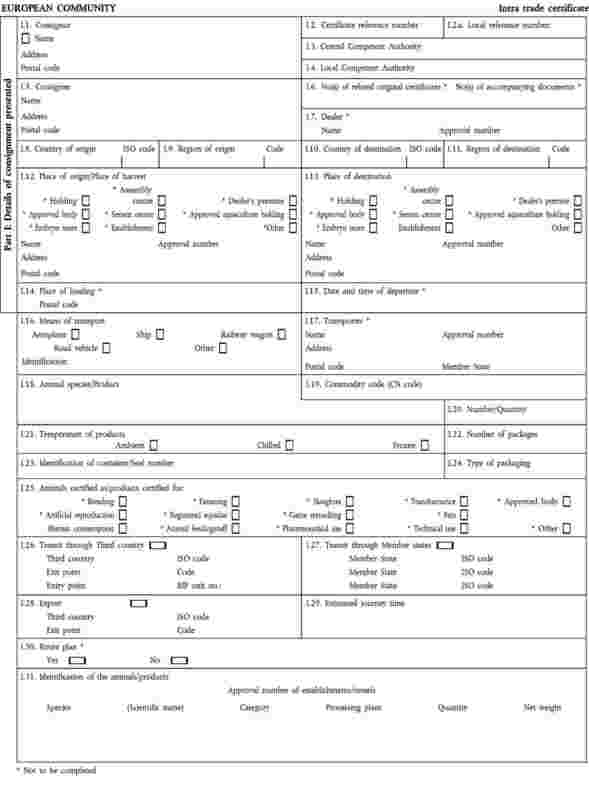 (15) EN/ISO 6579: Microbiology of food and animal feeding stuffs — Horizontal method for the detection of Salmonella spp. (16) NMKL method No 71: Salmonella. Detection in food. The non-destructive sampling method as described in ISO 17604 standard, including the rules for storage and transport of samples must be used. For beef carcases, three sites must be sampled (leg, flank and neck). For pork carcases, two sites must be sampled (leg and brisket). An abrasive sponge sampling method must be used. The sampling area must cover a minimum of 100 cm2 per site selected. Samples from the different sampling sites on the carcase must be pooled before examination. Each sample must be duly marked and identified. Pieces of tissue must be obtained by punching a sterile cork borer into the meat surface or cutting a slice of tissue of approximately 25 cm2 with sterile instruments. The samples must be aseptically transferred into a sample container or plastic dilution bag and then homogenised (peristaltic stomacher or rotary blender (homogeniser)). Samples of frozen meat must remain frozen during transport to the laboratory. Samples from chilled meat must not be frozen but kept refrigerated. Separate samples of the same consignment may be pooled as established in EN/ISO 6579 standard, up to a maximum of 10. Pieces of meat must be obtained by sampling of approximately 25 g with sterile instruments. The samples must be aseptically transferred into a sample container or plastic dilution bag and then homogenised (peristaltic stomacher or rotary blender (homogeniser)). Samples of frozen meat must remain frozen during transport to the laboratory. Samples from chilled meat must not be frozen but kept refrigerated. Separate samples of the same consignment may be pooled as established in EN/ISO 6579 standard, up to a maximum of 10. Random samples must be evenly distributed through the whole consignment. Sampling must consist of pieces of about 10 g of neck skin to be removed aseptically with a sterile scalpel and tweezers. Samples must be kept refrigerated until examination. Samples may be pooled as established in EN/ISO 6579 standard, up to a maximum of 10. Samples must be duly marked and identified. Pieces of tissue of about 25 g must be obtained by punching a sterile cork borer into the meat surface or cutting a slice of tissue with sterile instruments. Samples must be kept refrigerated until examination. Samples may be pooled as established in EN/ISO 6579 standard, up to a maximum of 10. Pieces of meat must be obtained by sampling of approximately 25 g with sterile instruments. Samples must be kept refrigerated until examination. Samples may be pooled as established in EN/ISO 6579 standard, up to a maximum of 10.
in the case of laying hens in cages, such samples are to be taken from scrapers or from surface droppings in the pit. in case of the method referred to under 2.: 60 faeces samples must be taken, or at least 60 gram of naturally mixed faeces. The flock must be sampled within a period of two weeks before the beginning of laying and thereafter at least once every 25 weeks. Commercial documents shall be produced, according to the layout of the model appearing in this Annex. It shall contain, in the numbered order that appears in the model, the attestations that are required for the transportation of meat from bovine or porcine animals or meat from poultry, including minced meat. It shall be drawn up in one of the official languages of the EU Member State of destination. However, it may also be drawn up in other EU languages, if accompanied by an official translation or if previously agreed by the competent authority of the Member State of destination. The commercial document shall be produced at least in triplicate (one original and two copies). The original shall accompany the consignment to its final destination. The receiver must retain it. The producer must retain one of the copies and the carrier the other. The original of each commercial document shall consist of a single page, both sides, or, where more text is required it shall be in such a form that all pages needed are part of an integrated whole and indivisible. 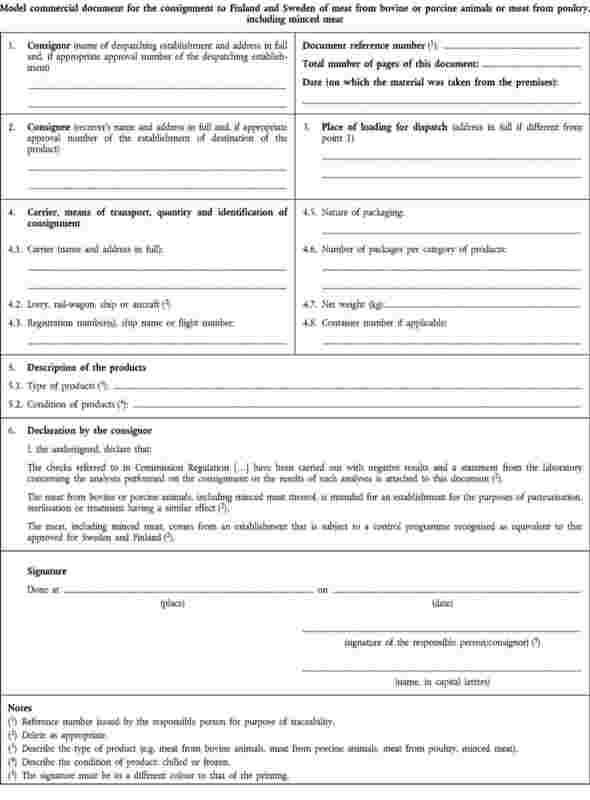 If for reasons of identification of the items of the consignment, additional pages are attached to the document, these pages shall also be considered as forming part of the original of the document by the application of the signature of the responsible person, in each of the pages. When the document, including additional pages referred to in (e), comprises more than one page, each page shall be numbered, (page number) of (total number of pages), at the bottom and shall bear the code number of the document that has been designated by the responsible person at the top. The original of the document shall be completed and signed by the responsible person. The colour of the signature of the responsible person shall be different to that of the printing.